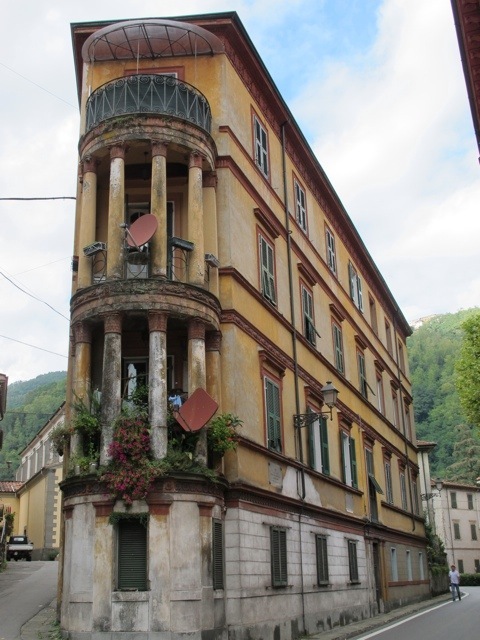 We almost bought an apartment in this gorgeous building designed by Lucchese architect Giuseppe Pardini. 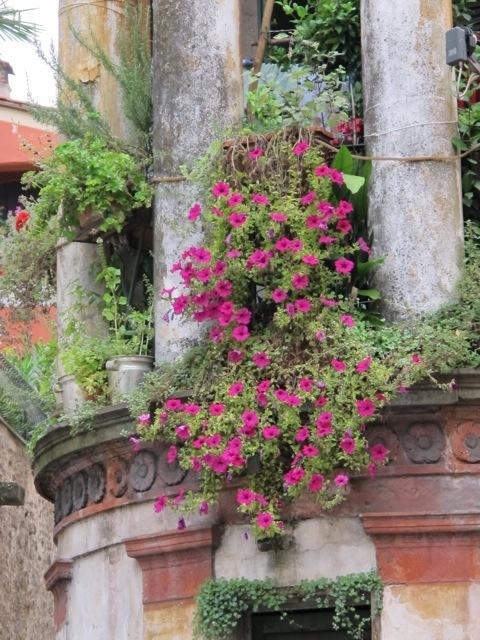 The building was constructed in 1838 and once housed the prestigious Hotel de Russie. The building has a colourful history. In 1904 – 1905 English writer Louise de la Ramee, better known as Ouida, stayed in the hotel. She is now buried in the English cemetery nearby. Click here to see more on the cemetery. During WWII the building was occupied by the German army. 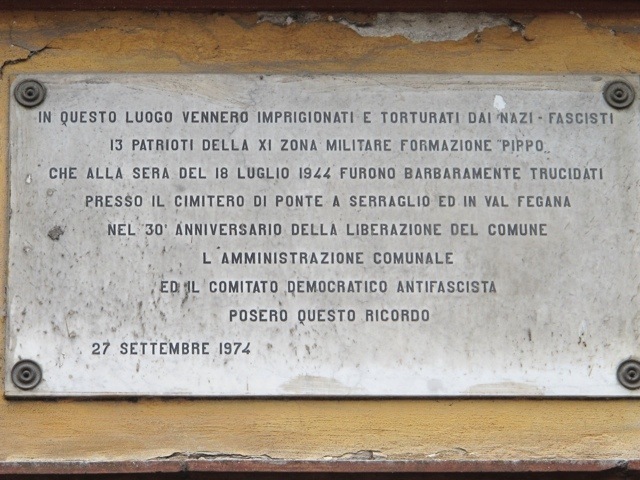 There is a plaque on the wall beside the street to commemorate the 13 patriots who were imprisoned inside. There are now 6 apartments here. 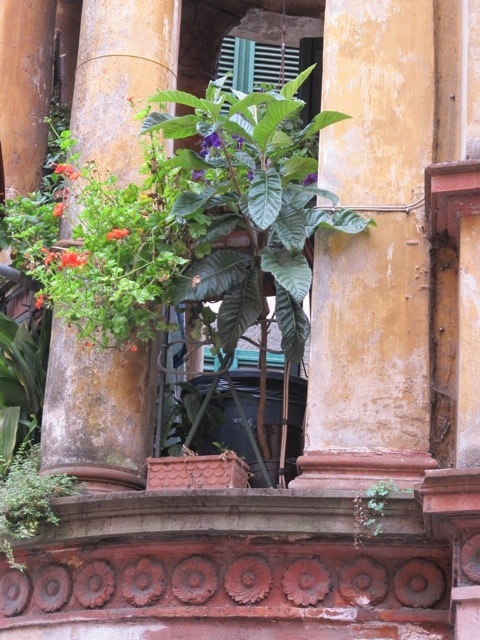 I particularly love the balcony at the front of the building. The middle one was almost ours. I would love to see the building renovated …….. but not too much. 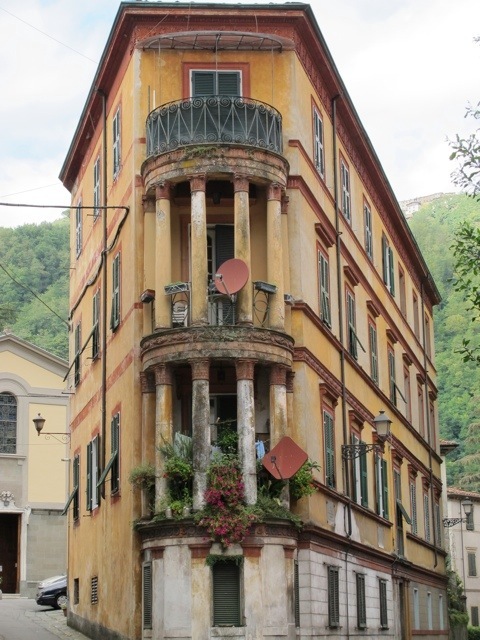 This entry was posted in Things to see and do and tagged architecture, Bagni di Lucca, Giuseppe Pardini, Italy, photography, Ponte a Serraglio, travel, Tuscany by Debra Kolkka. Bookmark the permalink. This is a breathtakingly beautiful building. Thanks for sharing the photos. It is stunning, imagine how good it would look with a coat of paint. True, but the way it is, it has a lot of character. I wouldn’t want to change it much, just brighten it up a bit. I also love that building; however, it is nowadays enclosed by many other buildings and a busy road. I do not think it will have too many views. On the other hand, your apartment has great views over the river, the bridge and the mountains, which are irreplaceable features. 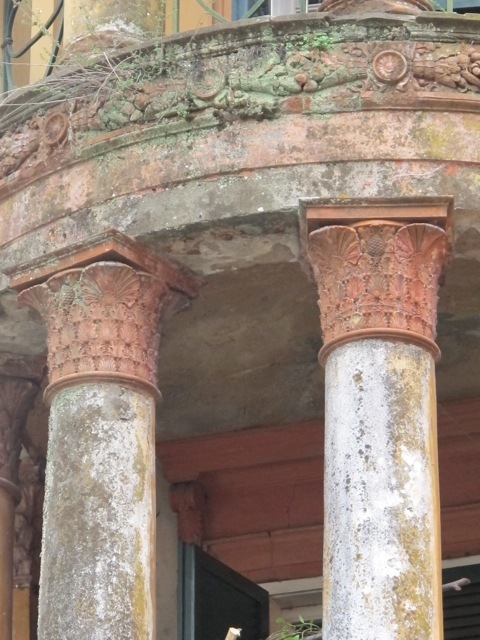 Also, the old building is in urgent need of maintenance… just as you said, not too much but enough to bring back its old splendor. And I would get rid of the ugly aerials!!! Our apartment is also beside a busy road, but I love to be in the centre of things. I’m sure I would have loved living in that building, I just walking past it. I was just thinking that as looking through the pictures…a touch of renovation would just bring out its beauty..love those verandas too!! I can imagine myself sitting on that balcony. I would fill it with flowers. we didi actually buy an apartment in this building, the top front one. It’s a nice feeling, living in a piece of history. Renovation wise, yes it does need some cosmetic work however I fear trying to organise everything and everyone (especially as the building has listed status) will be like herding cats! I’m also pleased to report we do have nice views – up towards the Abetone mountains from the balcony and across the river to the hills beyond the Casino from the bedrooms. I hope those cats get herded one day. The apartment below you, which is the one we wanted to buy had a view as well, but not as good as yours. Lucky you, living in that gorgeous building. This is lovely. There is a lot of mould that should be taken care off before too much damage is done. It would probably be great with a bit of sandblasting to clean it up. I love all your posts, and plan to visit! It definitely needs a bit of love and care. Nice! Can I have the balcony room at the very top, please? I would sit out there with hot tea and biscotti every morning. If you look through the comments you will find the owner. He may invite you for tea. I love the way it hugs the corner. It’s beautiful just the way it is. Give it a little pat for me as you walk by. I’ll stroke it for you next time I pass. Beautiful building. I suspect pretty much everyone who passes it wonders what its like inside. I agree, it looks like the “flat iron” building! I love old buildings, so much history and you cannot duplicate the architecture. Great shots! I love the quirky angles and shape! It makes me wonder what the rooms inside must look like! Advertise all you like! I am very keen to see inside. Your blog, as always, tells and shows more about the area than all the guidebooks put together. I stayed frequently last year at Hotel Corona, almost opposite, and was always fascinated by this building. Thanks also to ex:townie for the inside views. 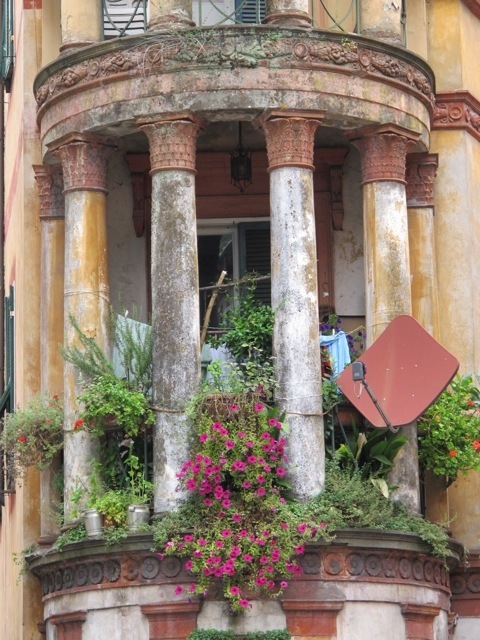 It looks much better kept than the outside – as is usually the case in Italy! I had never heard of Ouida before coming to Bagni di Lucca and then, by coincidence, found a blue plaque to her on a house near where I work in London. I investigated, and wrote a piece about here (http://h2g2.com/dna/h2g2/brunel/A87735757). What an interesting woman! Thank you the story, it is a great read. She really didn’t spend all that much time in Bagni di Lucca, but her grave is very impressive. Thank you very much for the nomination, I feel honored. No worries at all. Your posts are so captivating, the images are stunning! I wish I was there!